Tom and his story are not unique. Like Tom, thousands of the 315,000 East Tennesseans who live in poverty face problems that could be solved if only they could afford to hire a lawyer. Legal Aid is in the business of solving those problems — and delivering happy endings — at no cost to the “Toms” in the 26 counties Legal Aid serves. Last year, Legal Aid’s team of 29 lawyers, 19 paralegals, and support staff solved 6,459 legal problems for over 13,000 people. If you have given this year, thank you for your generosity! 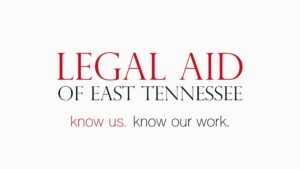 If you have not yet donated, please consider the impact your gift of justice will make on the lives of East Tennesseans. 1001 W. 2nd North St. If you are a victim of domestic violence and are in immediate danger, call 9-1-1. You may seek an Order of Protection if you are a victim of domestic abuse or violence. Contact your county’s Circuit Court or General Sessions Court Clerk’s office. You should also contact law enforcement.